The action movie, SPL 2 <殺破狼2>, which is produced by Wilson Yip (葉偉信) and stars Hong Kong actor Simon Yam (任達華) and mainland Chinese actor Wu Jing (吳京), will open in theaters on June 18. In SPL 2, Hong Kong detective Zhijie (Wu Jing) willingly becomes a drug addict in order to investigate a crime syndicate led by Hong (Louis Koo 古天樂). Unfortunately, Zhijie’s superior and uncle (Simon Yam) decides to halt the operation, leading to the discovery of the mole. Zhijie finds himself thrown into a prison in Thailand, where he strikes up an unlikely acquaintance with a policeman-turned-jailer named Ah Cai (Thai actor Tony Jaa), who is desperate to rescue his daughter suffering from leukemia. Because Zhijie happens to be the only suitable bone marrow donor, Ah Cai strives to protect him, even when the head prison guard (Max Zhang 張晉) tries to have Zhijie eradicated. 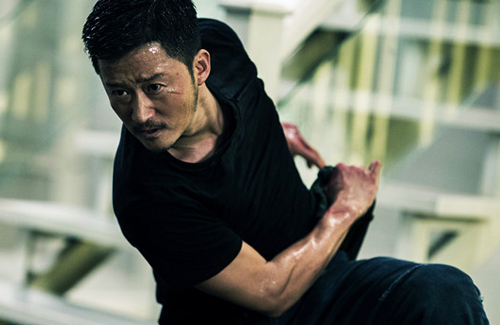 As expected from a Wilson Yip film, SPL 2 features many exciting action scenes, including a waterboarding torture segment that Wu Jing had to personally undergo. At a recent press conference, Wu Jing shared that whenever he, Tony, and Max finished filming a difficult fight scene, they would embrace one another in order to celebrate. Wu Jing also praised Tony Jaa, saying, “After all these years, I’ve finally met my match.” Tony, who is an expert in Muay Thai, has worked as a stuntman and actor in many movies in his native Thailand, and he even made his Hollywood debut in the recently released Furious 7. SPL 2 marks his first foray into the Hong Kong film industry. SPL 2 is the sequel to the 2005 action flick SPL: Sha Po Lang <殺破狼>, which was released as Kill Zone in the United States. Although SPL was a box office hit, it was deemed too violent and was not approved to be released in mainland China. However, SPL 2 has received approval for release in mainland Chinese theaters, even though production company Bona Film Group has deemed it “even more ferocious” than its predecessor. SPL 2 also follows an interesting trend in movie names this year, as it contains the word “wolf” in its Chinese title. February saw the release of Wolf Totem <狼圖騰>, while April brought along Wolf Warriors <戰狼>. The latter was actually directed by Wu Jing himself and brought in an impressive 500 million RMB at the box office. He hopes that SPL 2 will continue with the same success.